A little over 34 years ago, Acorn Computers Ltd released a budget version of the BBC Micro, the Acorn Electron. For a time it was apparently the best selling Micro in the United Kingdom, although in more recent years the Electron seems to be overshadowed by its big brother the BBC Micro. 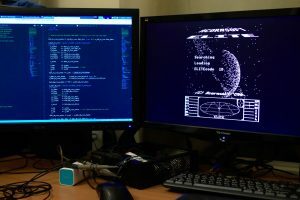 Elite running on the acorn electron core. This often overlooked Micro is now available as a core for the Replay. The core is fully functional allowing hundreds of games and applications to be loaded from “cassette” including the revolutionary Elite, the game that for many changed everything. Development work is on-going to improve accuracy. A new Amiga core was just released with a fix on the RTG interrupt + new RTG driver that handle the interrupt correctly. I’ve released a new version of the Amiga core (svn.fpgaarcade.com). RTG over analog/DVI/HDMI with hardware sprites and dedicated blitter engine. 1024×768 at 16 bit, 1280×1024 at 8 bit. I’m going to spend some time now updating the website and working on the AGA debug hardware so we can further improve compatibility. I also have some CPU upgrades in the pipeline which will allow x2-x3 speed up hopefully. A lot of work has been done both on the CPU to increase compatibility, and the core to get the cache working and timing closure. 2K Instruction plus 2K Data cache with full chipset snoop on both.Performance is around 11.3 mips / 10800 dhrystones with sysinfo 4.0. The RTG dedicated blitter is working, and this coupled with the fast hard disk speed makes the system feel highly responsive. I’ve added some modes to the scan doubler to help DVI monitors work. Low pass filters on the audio (optional). HRTMon cart working again with custom & cia shadow and full VBR support. Config is editable from the .INI file.